« A Spoof about Mastercard WikiLeaks? Priceless! If you’ve traveled out of Terminal 1 at FLL recently and inexplicably lost electronics or other valuables, chances are this guy swiped them. Give a big “F.U.” to Nelson Santiago, a TSA employee since 2009, who was caught this week by a Continental Airlines employee pilfering an IPad out of an unsuspecting travelers luggage and jamming it into his pants. "I'll pat your pants while I put your stuff in mine." 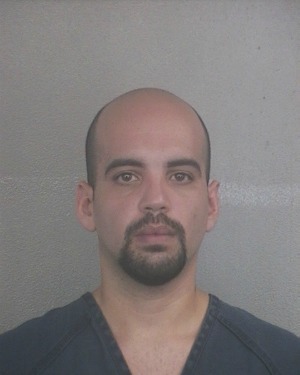 He was placed under arrest by the Broward Sheriff’s office and charged with two counts of grand theft, and then the 30-year-old Santiago confessed to having lifted all manner of valuables including computers, digital and video camers, GPS systems and other assorted electronics from bags he was supposed to be screening. He would then photograph the stolen schwag and post them online for sale. The coppers estimate that he made off with about $50,ooo in stolen merchandise in just the last six months. Sadly, most of the items have already been sold and will not be able to be recovered. Santiago bonded out on Monday and is facing more charges pending an in-depth investigation. Needless to say, he is no longer employed by the TSA. This is an isolated incident but I’d guess that it’s happening on a larger scale than anyone realizes. So, what’s next? Do we need an even Bigger Brother to keep the current Big Brother in line? Mutual pat-downs? What? Let us know what you think! Do you believe you’re a victim of this Santiago douche? Post your comments here! I impressed, I must say. Actually rarely do I encounter a blog that each educative and entertaining, and let me tell you, you’ve hit the nail on the head. Your concept is outstanding; the difficulty is one thing that not enough persons are speaking intelligently about. I’m very pleased that I stumbled throughout this in my seek for one thing regarding this.